Our She Leads In-Conversation events provide Canberrans with the opportunity to hear from women leaders from different backgrounds and industries, in a conversational format, followed by a live Q&A session and networking. 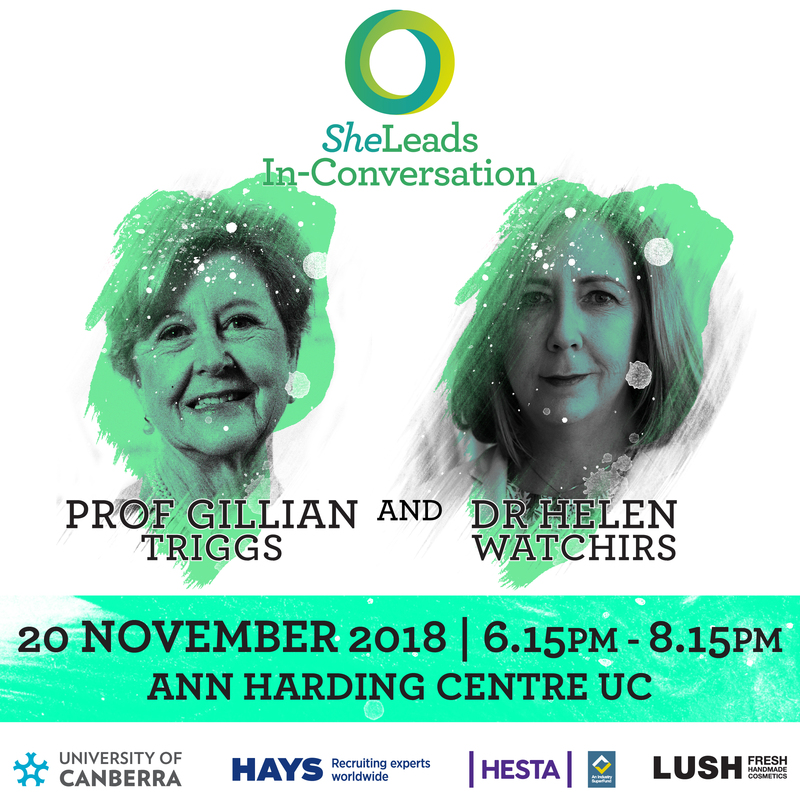 Join us to hear from Professor Gillian Triggs In-Conversation with Dr Helen Watchirs. The conversation will centre around Professor Triggs’ new book, Speaking Up, her tumultuous leadership journey and how her unwavering convictions have proved her to be a champion of human rights. This is a rare opportunity for you to hear from the current ACT Human Rights Commissioner and the former Australian Human Rights Commissioner on their experiences defying unparalleled government constraints. Professor Gillian Triggs is the former President of the Australian Human Rights Commission, a pioneer for human rights and fundamental freedoms. She holds a rich career in both academia and as a barrister. She has always utilised her platform in order to speak up, challenge norms and push boundaries. Come and join us in listening to Gillian divulge in depth details regarding her book, Speaking Up as well as the controversies she has encountered within her former position at the helm of the Australian Human Rights Commission. Dr Helen Watchirs is the current President of the ACT Human Rights Commission. For 33 years, Dr Helen Watchirs has dedicated her career and worked unstintingly as a volunteer to improve human rights and to end discrimination. As the ACT Human Rights Commissioner for more than a decade and the Discrimination Commissioner for more than a decade, Helen has supervised the handling of more than 1,000 discrimination, vilification and sexual harassment complaints. Helen has audited detention centres for human rights abuses, driven debate to increase transparency and accountability of government and pioneered community education projects. The opportunity to connect with and be inspired by aspiring and established Canberra leaders. To purchase a ticket, please head to our Eventbrite page. Please note: photographs will be taken at this event. If you do not wish to have your photo published, please contact the She Leads team at sheleads@ywca-canberra.org.au. Also note that parking at the University of Canberra is free from 6pm onwards, and there are a range of alternative transport options available (see the University’s transport page). View the She Leads refund policy here, and the She Leads participation policy here.